The 2017 Hyundai Tucson gains a handful of minor changes, after a thorough revamp last year. Poised to go head-to-head with the Honda CR-V, Toyota RAV4, Ford Escape and many others, the 2017 Tucson is a stylish and smart entry into the hotly contested compact-crossover-SUV market. A hydrogen model based on the last-gen version is exclusive to select California buyers. Great gas mileage, great space with some minor inconveniences. My Tucson is a great vehicle. It gets great gas mileage which was important to me, because I drive all over my city for work. It drives smoothly too, which is sometimes not the case for small SUVs. I also love the clear Bluetooth reception when talking on the phone as that is a feature I also use frequently. The room in the back trunk area is good. I can fit all my work stuff in there easily or I can fit my two medium size dogs (45 & 55 pounds) back there. We have also dropped the back seats to be able to transport futons and mattresses when moving college age children. There are only two things that I consider to be drawbacks in this car. First, it is an eco friendly car (which is great in theory), except when going from a full stop to an acceleration, it does not have the jump you need to get across a lane of traffic smoothly. You can turn off the eco feature, and then it jumps out well, but it turns the eco feature back on every time the car is restarted. The other thing I dislike about the vehicle is the button to close the back hatch. You cannot just close the hatch, you have to push a button, and it slowly opens or closes. It is slow and inconvenient when you are in a hurry. My 2017 Hyundai Tucson saved my life!! Before I bought my 2017 Hyundai Tucson, I had previously only owned smaller vehicles. One of the main reasons for purchasing the Tucson was the very high safety rating, plus Hyundai offers one of the best warranties out there. One week after purchasing the Tucson, I hit a deer that jumped out in front of me at night on the interstate going 70 mph. This vehicle saved my life. The fact that it was a crossover definitely helped, but structurally this vehicle is very sound. Other than the safety aspects, the Tucson looks very sporty but elegant at the same time. I got the se plus, which came with a navigation system. I love it! I'll never buy another Tucson without it. 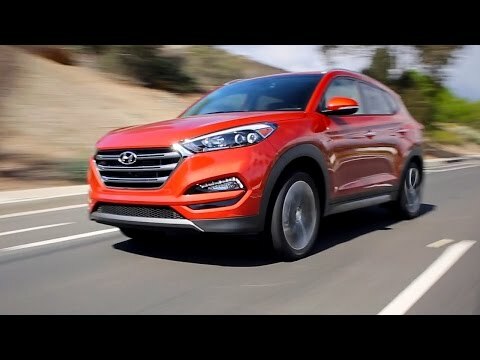 The vehicle is very ergonomic, there is a ton of cargo and storage space, and even though Hyundai gives you the luxury of many different setting and controls in this vehicle, they also design it where you do not have to be tech savvy to use them. The vehicle also handles itself on the road like a champ. Love the back up camera best feature ever. My car has all the standard features that you would expect from a new car. Electric windows, electric locks, Bluetooth, the capability to pair multiple phones so we can switch between devices for music playing. The best feature by far is the backup camera. We love the back up camera and has really helped me with parking and backing up. There have been a couple of recalls that had to be dealt with that caused us some major issues with the car just turning off while driving but it was fixed quickly and it has worked just fine since then. We have traction control and have had zero problem driving in the snow or with hydroplaning. I feel very safe driving my car and letting my newly licensed daughter drive my car. We have taken many broad trips and have been very comfortable in the car. 2016 / 2017 Hyundai Tucson 1.6T Sport Review and Road Test | Detailed In 4k UHD!